HR 1044 has 179 Democrat sponsors and 80 Republicans. The total sponsor count has increased from 116 to 259 since it was introduced. Giving relief to legal workers especially from Indian and China is gaining momentum. HR 1044 has been referred to the Subcommittee on Immigration and Citizenship on Mar 22, 2019. The bill is progressing. HR 1044 has been introduced in congress by Congresswoman Zoe Lofgren and Congressman Ken Buck on Feb 7, 2019. Chances of HR 1044 Passing and becoming Bill? HR 1044 is currently at introduction stage. There is a long way to go before it is passed by house and then signed by President to make it a law. If HR 1044 passes in current congress, the changes will take effect from September 30, 2019 (Fiscal Year 2020). HR 1044 is the new and modified version of HR 392. HR 392 did not pass the last congress voting due to the concerns raised by many that it will un-fairly incline the Green Card distribution in favor of two highly backlogged countries at this time i.e. India and China. To address the concerns raised by non-backlogged countries and protect their Green card availability, new provisions have been added to HR 1044. Oct 2019 to Sep 2020 will have at-least 15% of Green Cards for non-Indian and non-Chinese people. Oct 2020 to Sep 2022 will have at-least 10% of Green Cards for non-Indian and non-Chinese people. Starting Oct 2022, there will be no country based limits for any country. Anyone with an employment based approved i140 will get preference on first filed first processed manner. Per country RESERVED Family Green card limit will be set to 25% of total GCs. “Do no Harm” clause in HR 1044 – Anyone with an approved I-140 is guaranteed to receive Green card earlier than the person without approved I-140 at this time. This means that If your GC priority date is later than someone else’s, your pending I-485 would remain pending until USCIS reaches your PD date. These changes would address any concerns raised by American Hospital Association or American Iranian Council earlier in HR 392. HR 1044 aims to amend the Immigration and Nationality Act to eliminate the per-country numerical limitation for employment-based workers like H1B, L visa. This Fairness for High-Skilled Immigrants Act of 2019 wants to increase the per-country numerical limitation for family-sponsored immigrants. 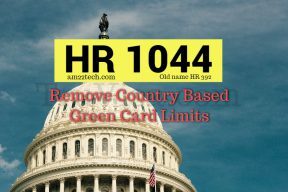 HR 1044 wants to issue US green Cards on a first-come, first-serve basis instead of Country of Birth. At this time, each country has a numerical limit of 7% (9,800 of the 140,000 annual green cards limit) green cards that can be issued which pushes countries like India and China at huge backlog with waiting period of more than 20 years. This will also help avoid the problem of H1B worker kids ‘Ageing out‘ on turning 21, which effectively makes them start their own Green Card process.